Lincoln Park’s first Seniors’ Prom was so successful that they’ve already begun planning for next year. Stars, glittering silver and gold, hang down over the scene. Women dressed in their evening best, and men in black, ironed suits dance around the room to the beat of a well-known song. Lincoln Park’s first-ever seniors’ prom is in full swing. 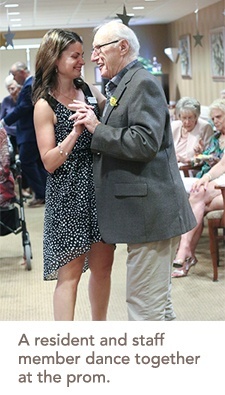 Bianca Vasile, a nurse at Lincoln Park, came up with the idea for a prom. Bianca has a strong dance background, and thought it would be nice to share that passion with the residents. A professional photographer was set up in the exercise room, which had been entirely re-designed and converted into a photo booth. 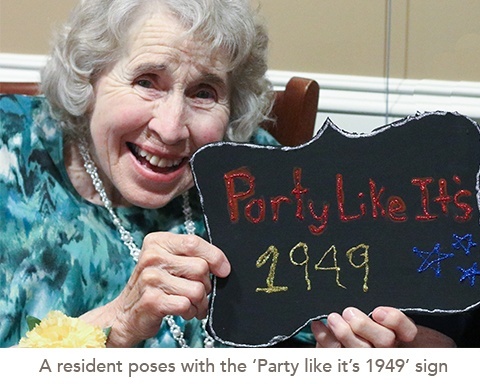 Residents came in pairs and groups to get their photos taken with props and friends. Meanwhile, the dining room was cleared and transformed into a dance floor, with chairs framing the room. There was even a thank you letter submitted to the Lincoln Park newsletter from a group of residents, saying what a wonderful time they’d had at the event. 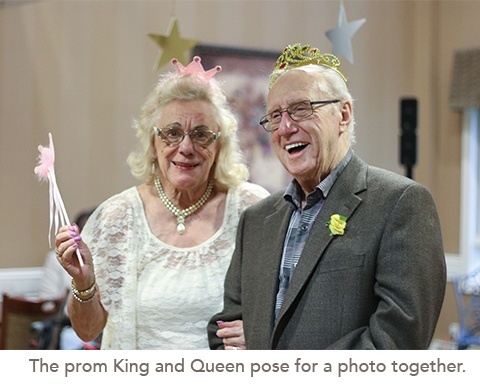 The photographs capture that laughter, with residents smiling behind a sign saying ‘Party like it’s 1949;’ couples dancing, surrounded by the shimmer of glow-stick necklaces; and, of course, the crowning of the prom king and queen. Today, multicolored corsages can still be seen all around the residence. They’re tied to walkers and doors, a reminder of the first of many amazing nights.